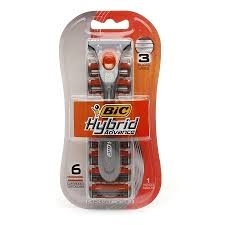 Get a close and clean shave every day with the BIC Hybrid Advance. This pack contains one disposable handle and six cartridges. The BIC razor is designed with a pivoting head for a comfortable shave and boasts of triple-blade closeness for a smooth finish. The lubricating strip contains aloe and vitamin E.